This article provides instructions to uploading media files in the Library. The maximum file size limit for content uploads is 2GB, due to limitations set by IIS. Click the Quick Actions menu on the top right and select Upload Media, and proceed to step 3 below. Click the ADD button, and select Upload Media. In the Upload window, drag-and-drop content from an open folder on your desktop, or click the select files link and browse for content. 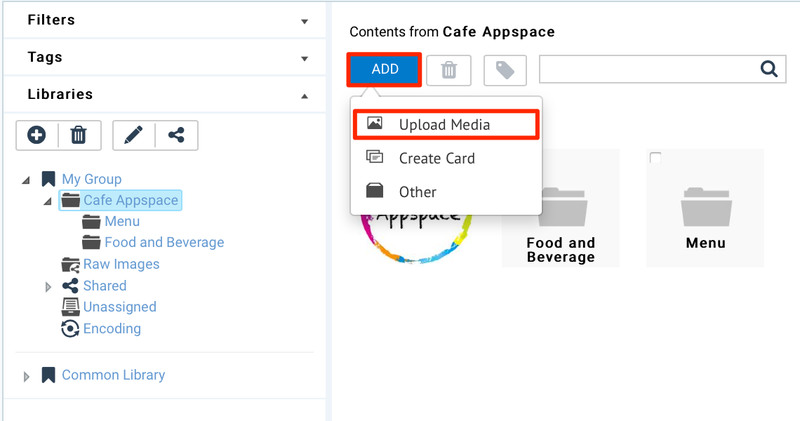 If uploading media via the Quick Actions menu, ensure the Upload Location points to the correct folder within the Library, as it defaults to the Common Library folder. You can continue dropping files into the drop zone, while other content items are still being uploaded. Also, uploaded content items can be edited or removed before being added to the Library. Click Save once the upload is complete. To configure content properties, double-click the desired content in the folder. In the Summary tab, enter in the Title, as this is a mandatory field. Optionally, you may enter in the Article, Caption, Content Expiry, Content Tags and even upload a custom thumbnail for the content. For more information on Content Expiry, click the Setting Content Expiry article. To preview or download content, click the Preview, or Download buttons respectively. Additional content information such as type, and size can be viewed by hovering on top of the ellipse. Content item Titles and Description can be used via action scripting. E.g. On media load, set plain text to content items title. Click the Attributes tab to display attributes and values associated to the content. Additional custom attributes and values can be filled in their respective Attribute and Value fields. These attributes cannot be accessed through action scripting. They are used primarily to provide additional identification to the content item. Click the Allocations tab to display a list of channels the content is allocated to. To delete content, select the desired content, and click the Delete selected media button. Click OK to confirm. 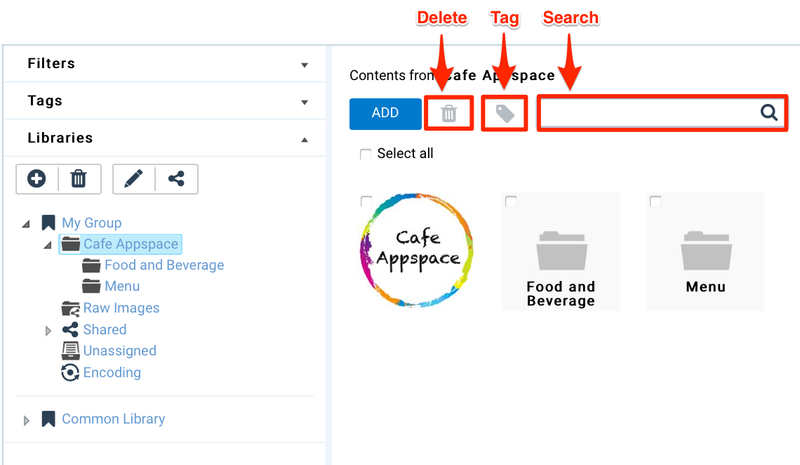 To tag content, click the Tag selected media button, and enter in the tag name or select from a list of existing tags. Click Apply to assign the tag to the content. To search for content, enter in the keyword in the Search field, and click the search icon, or press Enter. The search results are displayed in the content listings.